Neil Armstrong was an Eagle Scout and the first person to walk on the moon. I have heard that everyone who has walked on the moon (through 2012), was an Eagle Scout. If so other then attributes of birth (country of origin, etc), are there any other accomplishment they all share? No, they were not all Eagle Scouts. While at least forty astronauts earned the rank as a youth Eagle scouts, in fact only two Apollo moonwalkers did: Neil Armstrong and Charles Duke. The Bald Eagle is however the USA's National Emblem and often depicted on badges, pins, buttons, insignia, and other emblems, so chances are they all wore on their person "The Eagle" in one form or another while walking on the Moon. Armstrong acknowledged Aldrin's completion of the post landing checklist with "Engine arm is off," before responding to Duke with the words, "Houston, Tranquility Base here. The Eagle has landed." 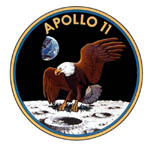 Armstrong's unrehearsed change of call sign from "Eagle" to "Tranquility Base" emphasized to listeners that landing was complete and successful. Duke mispronounced his reply as he expressed the relief at Mission Control: "Roger, Twan-- Tranquility, we copy you on the ground. You got a bunch of guys about to turn blue. We're breathing again. Thanks a lot. So in the strictest sense of the title of your question alone, it might have as well been that so far, only Eagles have walked on the Moon. Not the answer you're looking for? Browse other questions tagged the-moon astronauts apollo-program myth-busting or ask your own question.